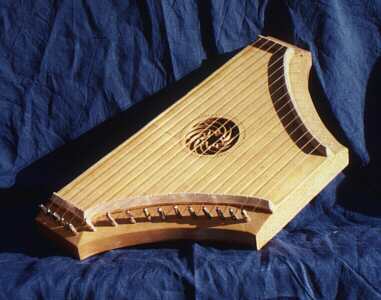 The psaltery is a medieval zither. The metal strings of the Instrument used are made of bronze according to historic sources. Compared to steel strings the sound is rather bell-like. The strings are normally plucked with a plectrum oder the fingernails. The picture shows a Psaltery of the 14th century from the book: De Arythmetica, De Musica by M. Servinius Boetius. Psalter Steg Program 107 Bank 2 plucking the strings near the bridge results in a slightly sharper sound. Psalter geschlagen Program 16 Bank 3 to achive the sound of a small, typical medieval dulcimer the strings were beaten with a dulcimer mallet.